Good news: Unlike employees, an independent contractor (“IC”) is not eligible for unemployment benefits when the work relationship terminates. C. Is engaged in an independently established trade, occupation, profession, or business. This “ABC Test” exists in most states, though the elements/sub-elements may vary slightly. Typically, the party seeking IC status has the burden to prove that all three of these elements are satisfied. Neither an IC agreement nor designation controls. Worse news: Administrative agencies (e.g., unemployment agencies, workers’ compensation/industrial commissions, and departments of labor and tax/revenue) may share information with each other regarding independent contractor misclassification. This may increase the risk of an audit by one agency triggering an audit by others. An appellate court applied the ABC Test to IC window washers under a three year unpaid contributions audit, and found them to be employees, affirming an administrative finding of $64,051 in unpaid unemployment contributions plus $35,773 in unpaid interest. L.A. McMahon Bldg. Maint., Inc. v. Dept. Employment Sec., 2015 IL App (1st) 133227 (May 7, 2015). The court found unpersuasive that the workers: were not exclusive or required to wear a uniform; used their own vehicles and supplies, for which they were not reimbursed; received no training or direction in their work process; advertised their own services; and hired their own helpers and employees. Instead, the court found that the window washers were employees because their services were central to the business which could not exist without them (e.g., Element B). The company’s “place of business” extended to each location where the workers represented the company’s interests (customer’s homes), especially since the workers carried the company’s price card and invoiced under the company’s name. Ensure that the IC is a bona fide corporation or limited liability company. Outside counsel should audit the relationship now to ensure that it is actually “independent” before a worker files a claim with any federal, state, or local administrative agency (triggering anti-retaliation protections!) and/or an agency initiates its own audit. This entry was posted in Employment Policies, Independent Contractor and tagged ABC Test, independent contractor, Unemployment Insurance on May 22, 2015 by smithamundsen. Last week a federal appeals court ruled FedEx drivers are not independent contractors, but rather employees. The decision prompted many to ask, FedEx drivers are classified as independent contractors? In fact they are. According to the decision, Alexander v. FedEx, drivers provide their own vehicles (which must meet detailed specifications), pay their own operating expenses, determine their own routes, (provided they deliver the assigned packages on time) and sign an operating agreement accepting the independent contractor arrangement. The FedEx case arose because a group of drivers challenged the independent contractor designation. However, various governmental agencies can and regularly do launch investigations on this issue even when the parties involved are happy with the independent contractor arrangement. The employee verses independent contractor distinction has potentially huge implications for payroll taxes, unemployment, social security, wage rates, overtime, benefits, exposure to liability, and applicability of various employment laws – worker’s compensation, Title VII, ADEA, ADA, FLSA, FMLA, and more. The IRS, state taxing authorities, unemployment agencies, state and federal departments of labor, and the EEOC and its state and local counterparts all have a stake in whether an individual is an employee or an independent contractor. To complicate matters further, each agency has its own criteria for differentiating between the two, and one agency’s determination is not binding on another. There are no hard-and-fast rules; the IRS alone considers 20 factors. Though each agency has its own means to determine when an independent contractor is actually an employee, it generally boils down to how much control you retain over the performance of the job. Referencing California law, the Alexander court stated: “The principal test of an employment relationship is whether the person to whom service is rendered has the right to control the manner and means of accomplishing the result desired.” In other words, do you oversee the process or simply dictate the end result? FedEx drivers must wear company uniforms, use company scanners, abide by the company’s appearance, service and safety standards, drive company-approved trucks, and deliver their assigned packages within a specified time window. This, the court concluded, amounts to sufficient control over the manner and means of their work to render them employees despite their written acceptance of independent contractor status. Realize the distinction is determined by law, not choice. The parties’ agreement that an individual is an independent contractor – even if in the form of a written contract — does not make it so. If the individual performs work for your organization exclusively and/or for an extended period, it will likely be difficult to justify an independent contractor relationship. If the individual is regularly engaged in performing a service for hire and performs that service for others, independent contractor status may be appropriate. If he has formed his own business entity, your chances are likely better. Involve competent counsel at the on-set; don’t wait until problems arise. It is far more cost effective to address these issues up front than it is to defend an audit or a lawsuit and sort out back taxes, back wages, penalties and fines. This entry was posted in News & Tips and tagged independent contractor on September 2, 2014 by smithamundsen. Franchisors across the U.S. may be surprised to learn that the general counsel for the National Labor Relations Board has taken the position that they are likely joint employers with their franchisees under the National Labor Relations Act (NLRA). The announcement came in the context of finding joint liability for alleged unfair labor practices, but the true impact and purpose is to open the door to unionization of all employees of local franchises as a single bargaining unit of the corporate franchisor. Since 2012, the NLRB has received 181 complaints from employees of individual McDonald’s franchises claiming that their rights were violated when they were disciplined or fired for participating in union-organized employee protests. On July 29, 2014, the general counsel released a statement saying that his office is prepared to move against the individual franchisees along with franchisor McDonald’s, USA, LLC, as joint employer respondents on 43 charges unless settlements can be reached. In other words, the NLRB is going to try and muscle McDonald’s into submission. Time will tell how it all plays out, but it is anticipated that the courts will ultimately have to intervene. Since the early 1980s, a finding of “joint employer” status requires both entities to exercise direct and immediate control over the employees and the terms and conditions of their employment. Determinative factors include having the power to hire and fire, setting work schedules, determining rates of pay, and keeping employment records. These factors rarely exist in traditional franchise arrangements. In June, the NLRB accepted amicus briefs in an active matter involving the joint employer/franchisor issue. While numerous manufacturing, hospitality, and business associations strongly advocated for retaining the current test, the general counsel’s brief argued that the direction and control test fails to take into account shifts in the U.S. workforce such as increasing use of contingent employees, outsourcing, and franchising. The result, the GC argued, is to frustrate the purpose of the NLRA by limiting opportunities for collective bargaining. The general counsel went even further, suggesting (without citing actual specific factual evidence) that corporations have moved to the franchise model for the specific purpose of limiting collective bargaining. The general counsel proposed an “industrial realities” test; arguing that a franchisor’s control over matters such as pricing, inventory, branding, and supply, effectively dictate the terms and conditions of employment that franchise owners could offer their employees. It is no secret that the current NLRB is all about providing opportunities for collective bargaining and with an estimated 3-5 million fast food workers in the U.S., many of whom are paid at the lower-end of the wage scale, it’s not surprising that unions have focused their efforts on that industry. The expense and effort of organizing and negotiating with thousands of individual franchise units makes industry-wide unionization difficult. The ability to organize all 700,000+ McDonald’s employees through a single election and secure employment terms for (and dues from) those employees in a single collective bargaining agreement, however, would be a significant game-changer. Bottom Line for Employers: The general counsel’s statement does not have the effect of binding law and it could be years before a board decision applying a new joint employer standard works its way through the courts to become law, but franchisors and franchisees should be aware of the writing on the wall and be sure that the franchise documents, policies and practices clearly vest all employee-related decisions and duties in the franchisee. Additionally, employers should note that the underlying issue involved here goes well beyond the franchisor/franchisee relationship. 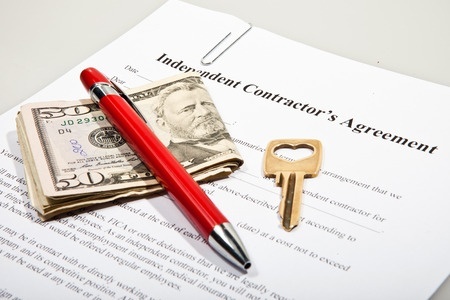 The real issue in play here is the larger INDEPENDENT CONTRACTOR or SUBCONTRACTOR relationship. From temporary staffing relationships (see https://laborandemploymentlawupdate.com/2014/07/09/nlrb-expanding-joint-employer-standard) to the 1099-worker, the NLRB is attempting to do everything and anything in its power to broaden the employer/employee relationship. In effect, the NLRB very much wants to allow labor unions to target “dual employers” and consequently organize employees in unprecedented numbers. Yes, the ‘Big Mac’ is under attack, and all employers who are part of a franchise agreement, supply or use temporary staffing and/or rely on independent contractors should take serious note — and continue to work with competent legal counsel on diminishing “joint employer” liabilities. This entry was posted in National Labor Relations Board and tagged independent contractor, NLRA, NLRB, Subcontractor on August 8, 2014 by smithamundsen. House Bills 923 and 2649 were signed into law amending the Illinois Employee Classification Act (IECA), effective January 1, 2014. The IECA sets forth strict requirements in order to lawfully classify individuals as independent contractors within the construction industry (defined very broadly by the act). The IECA has been amended to give the Illinois Department of Labor more oversight and authority to enforce this act. The recent amendments mandate that (1) contractors follow annual reporting requirements when contracting with an individual, sole proprietor, or partnership to perform construction services; (2) add individual liability; and (3) change the department’s method for enforcing the act (i.e. easing enforcement). Beginning January 1, 2014, contractors that make payments to an individual, sole proprietor, or partnership for construction services must report contact and payment information to the Illinois Department of Labor by January 31 following the taxable year in which payment was made. The department intends to closely monitor the use of (non-employee) sole proprietors and partnerships in the construction industry. Contractors that fail to submit required reports are subject to penalties and debarment. In addition, officers and agents of contractors who knowingly permit the contractor to violate the IECA, or are otherwise considered an employer under the act, are subject to individual liability. This provision does not apply to contractors primarily engaged in the sale of tangible personal property or doing work for a business primarily engaged in the sale of tangible personal property. Lastly, the enforcement procedure was drastically amended so that now alleged violations will be prosecuted by the Illinois Department of Labor through an administrative hearing, subject to administrative review in the courts. Currently, the Illinois Department of Labor’s administrative findings have no significant weight and violations must be proved by the Attorney General in the circuit court. This change to the enforcement procedure will give the Illinois Department of Labor substantial control and power in how this act is enforced. Interestingly, contractors in compliance with the responsible bidder requirements set forth in the Illinois Procurement Code are exempt from these statutory amendments. There are a number of requirements under the responsible bidder provision of the Illinois Procurement Code, but the one of most significance is the requirement that contractors have an apprenticeship program approved by the U.S. Department of Labor to cover each craft of work performed on the job. There has been a concerted effort to broaden the application of the responsible bidder requirements to contractors throughout Illinois, and it appears the strategy will be to give contractors who satisfy the responsible bidder requirements special treatment under other Illinois laws. This entry was posted in New Legislation, News & Tips and tagged construction, Illinois Department of Labor, independent contractor, U.S. Department of Labor on September 9, 2013 by smithamundsen.